January is a popular month for resolutions, detoxes, resets, etc. It’s the perfect time to reflect on the previous year, to look at what went right and what could have been better. 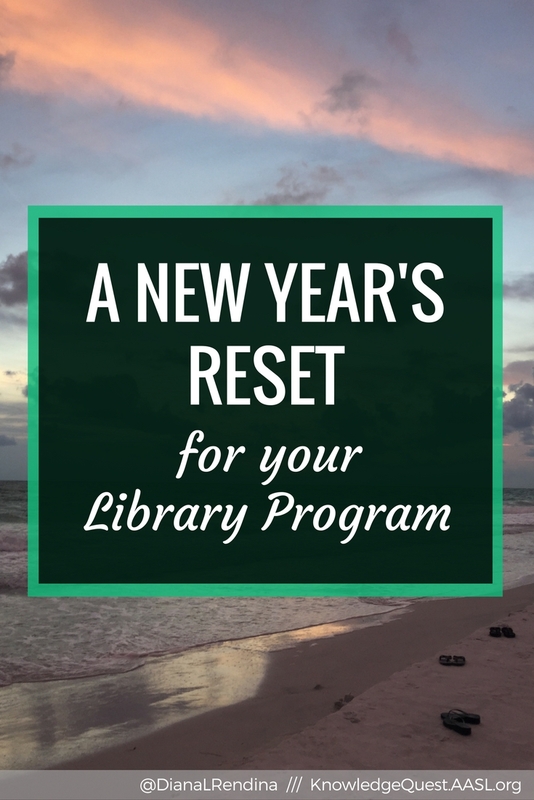 Being that it’s also the middle of the school year, I think it’s also the perfect time to take a look at our library programs and reset. Here are some strategies to work through and questions to ask as you reflect. The first semester may have been awesome for you–great! Or it may have been off. I know for me, the first semester at a new school didn’t go exactly as I had imagined it. Losing an entire week to a hurricane shortly into the semester didn’t help. But there were other things that were fantastic. Going into this new semester, I’ve definitely learned some things and have ideas for what I’d like to do. As you reflect back, take an inventory. What programs did you run in the first semester? Were there book clubs and maker meetups? Research lessons with classes? Story times? Make a list of all the things you did in the first semester. Make some notes on how they went. Was there a lesson that bombed? Were your maker meetups so successful that you had to add extra meetings? After reflecting, you might see some gaps in your program. Maybe there were things you just never got around to. As you plan your reset, make a list of different programs you’d like to try out. This first list can be exhaustive, in the next step, we’ll cull it down to a reasonable number of ideas. Or four or two. It all depends on what works best for you. I believe that slow, intentional change is the best way to grow. If you take on too many new things, it can be hard to do any of them effectively. So take a look at that previous list. Which items make you the most excited? Which ones have your students been asking about over and over again? These are the things you want to do. Startup Maker Mondays after school. They’re going to be pretty simple for now, as my goal is to start building a maker culture in my library and to gauge what kinds of activities my students are interested in. Collaborate with more classes on research. I’ve had a few research presentations lately that were fantastic. Students have been coming to the library for help with their research projects more and more. I had a junior the other day tell me that it was the first time he checked out a book, ever. Beta-test Battle of the Books. My middle school (my school is 6-12) hasn’t participated in Battle of the Books in years, and my admin is interested in starting it up. Since this will be the first year, I’m not putting a lot of pressure on me or my students. This year is a beta test to get our feet wet so that we can plan better next year. What are your New Year’s reset goals?